Samsung handed me an EX2F engineering unit for a quick review. The EX2F is tagged “the world’s brightest compact camera lens” at F1.4, until Panasonic leveled the playing ground with the Lumix LX7, also with F1.4. Wi-Fi Enabled. Samsung calls them “Smart Camera”, which enables the camera to connect to another device via Wi-Fi to transfer images. It can also stream live view, remotely zoom the camera and trigger the shutter via a smartphone. The camera also lets you login to social sites like Facebook, Flickr, YouTube. Articulated Screen. It allows me to shoot at odd angles and still see the screen perfectly. Metal body frame and rubber grip. It’s got a solid build feel, giving me confidence to abuse it – not that I would, but I could. Hot Shoe. This allows me to fit any conventional external flash for light boost. Dual dials, dual wheels and manual controls. There is a dial at the front grip, there is a dedicated shutter mode dial to set your shutter trigger, another dial to choose your shooting mode like PASM. I’d only wish they have even more dedicated buttons to allow me to set EV compensation rather than going into the Smart Panel to adjust. Built-in Filters, Effects and Collages. We’ve seen cameras with filters like Sepia, B/W, Lomo. Samsung EX2F has 3 effects that I thought was totally unique for a compact camera. 1. Picture-in-Picture. Snap a background image and then take another smaller one and move it anywhere within the background image. 2. Split Shot. You can take up to 3 images within a predefined collage layout. 3. Animated Sketching. After capturing an image, the camera processes into a video clip showing how the scene is sketched and painted out. When comparing the images with Lumix LX5, I find the EX2F is less aggressive in JPG processing. The images are more natural, with a little softness but retaining shadow details. The LX5, while looking sharp and contrasty out of the camera, suffers from loss of dynamic details at the shadows. Sometimes, no matter how good a camera is, social-savvy consumers would rather use their mobile phone’s camera to capture images so that they can edit and share quickly online. 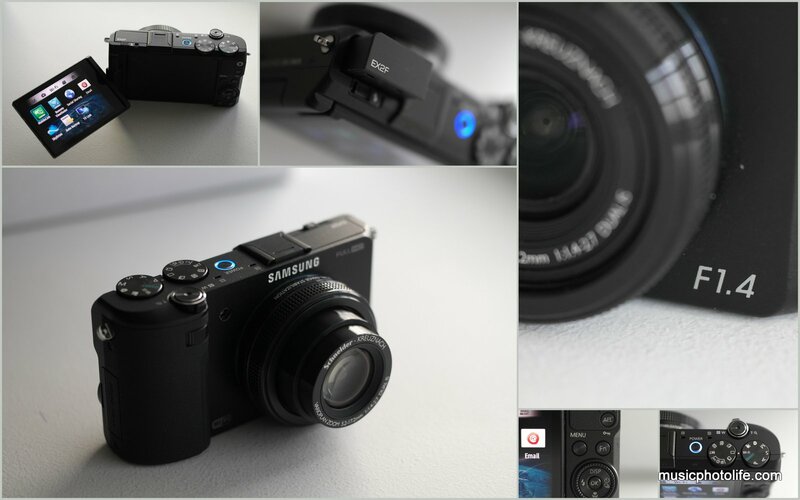 The Samsung EX2F allows you to upload images to social websites and to your mobile phone for sharing without compromising image quality.